The Gretsch Catalinas on my 2010 Europe tour. A good point in the comments of the How to be a jazz drummer post- the sound of your instrument is very important. If you’ve been playing rock, have a lot of cymbals with “POWER” printed on them, or have one of those generic drum sets with the 22″ bass drum and the big tom toms, this may mean buying some new gear. Fortunately, everything you need can be bought inexpensively used- here at Cruise Ship Drummer! we don’t throw money at our problems, and we don’t much give a crap about flashy new gear. The sound is what matters. Cymbals, particularly the ride cymbal, are the most important part of the set for a jazz musician. Part of the philosophy- I’m paraphrasing Mel Lewis here- is that you treat every cymbal as both a ride and a crash; so you don’t want your ride be too heavy or your crash to be too small/light. Your ride cymbal should be 20 or 22″, light to medium weight; your left-side cymbal can either be a 17-18″ thin to med. thin crash, or an 18-19″ light to medium ride, or “crash-ride”; hihats 13-15″, light to medium. We’re in a golden age of cymbals right now, with people like Bosphorus, Zildjian, Sabian, Paiste, Meinl, Istanbul, and many smaller companies making incredible hand hammered cymbals. One side effect of which is that the prices on regular old professional quality cymbals of the 70’s-90’s have come way down; and people have gotten pickier about appearance, so really dirty, funky-looking cymbals are even cheaper. People who only care about the sound can find some real bargains in A. Zildjians, Sabian AAs, Paiste 2002s and 3000s. Grungy-looking is good, tiny cracks (less than 1 cm) are acceptable (and will bring the price way down), “keyholing” is perfectly fine for you, but a good bargaining point for bringing the price down further. But as soon as you can save up about $275-325 for a used 20-22″ jazz cymbal made by any of the companies above, you should do it. K-type cymbals are very variable in sound, so be sure to play or at least listen to an audio sample of a cymbal before buying. Or if you can find an online dealer who’s judgement you trust- I like Cymbals Only– they can hand select one for you. I should mention that I have never heard a bad thin to medium thin Bosphorus… I personally would feel comfortable buying one blind. A couple of moderately priced options are the new Sabian Raw ride, and the old Paiste 602 ride- 602s are a jazz classic in their own right, and have been used on a lot of great records. They can vary wildly in price, but 20″ rides from the 60’s (no printing on the cymbal, and no serial number) can be had in the $180-220 range, approximately the same as a used Sabian Raw. A good way of salvaging a slightly too-heavy ride cymbal- like if the only decent cymbal in your price range is a used 22″ A. Zildjian ping ride- is to install rivets, making it into a sizzle cymbal. You can do this instead with your second cymbal (usually on the left side- the “crash” cymbal position) if you find yourself with a heavyish 18-19″ cymbal. Any drum shops should install them for you, but really, anyone with a drill press can do it. I’ve found that maple sticks get a more musical sound out of the drums than hickory; the wood is lighter, so you can use a fatter stick and still be quieter. Vic Firth SD-4 Combos are very popular, but I find them too small, and the sound too thin. I use SD-11 Slammers, which are about the size of a 5B; I can play quietly with them but still get a full tone. If you decide to stay with hickory, something smaller than a 5A is a good idea- either a 7A or one of the many signature models available. You’re also going to need to own some brushes and mallets. Any old brand of rubber handled telescoping metal brush will do fine. I prefer the Pro-Mark TB-3. Mallets tend to get destroyed, so I use whatever is cheapest at the moment- maple handles are preferred, along with a head that is not too hard or too fluffy. The first thing you can do with your drums is tune them higher, and remove all muffling. If you’re using heavier heads, like Remo Pinstripes, you should probably replace your heads- any normal medium-weight, single-ply head, coated or uncoated, will do. Coated Remo Ambassadors are standard; Remo Renaissance are also a nice option. You can get away with a slightly heavier had on the bass drum, with light muffling. If you do need (or want) to get some new drums, the standard jazz sizes are 18 or 20″ bass drum, and 12 and 14″ toms. Any snare drum is fine- I favor a 13″ because I prefer a low tuning, and can achieve without dropping the pitch too extremely. Much ink/bandwidth has been spilled/expended(?) 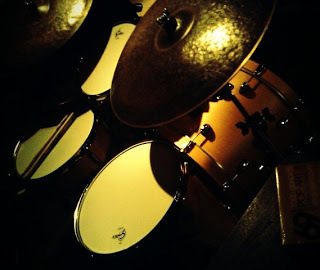 discussing the question of whether you really need “jazz” sized drums, but in the end, smaller drums have the sound and appearance the other musicians expect, respond best to the type of touch you use in a jazz setting, and are the most versatile- with the right tuning you can use them with just about any type of music. The option du jour for cheap jazz sets is the Gretsch Catalina with the 18″ bass, and 12 and 14″ toms. They look just like a real jazz drum set, are the right sizes, and are reasonably inexpensive- there are so many of them around that the used prices must be coming down a bit. Origin Records has a set permanently in Europe for touring artists, which I have used, and I can’t say I’m absolutely wild about the sound, but a lot of people are using them. A set I have a lot of experience with is the Tama Imperialstar Compact– called the Stagestar until a couple of years ago. Includes an 18″ bass drum, with 10, 12, and 13″ toms (the floor tom may be a shallow 14″- it’s been a little while since I’ve played one of these). I like these a lot- they tend to be a little cheaper than the Gretsches, have better hardware, and have an extra drum in case you want to fusion out. The appearance is just a little bit more “student” looking than the Gretsch. The Yamaha Manu Katche mini kits are also a good, very inexpensive option. The drums are very small- 16″ bass, and 10 and 12″ toms, so the sound is bordering on extreme, but they are entirely usable, surprisingly versatile, easy to schlep, and very fun to play. I owned a set of these for a couple of years. The extreme budget option, if you’re young and/or poor- or only care about the music- is a First Act set (don’t get this model with the skulls). It’s got an 18″ bass drum, 10 and 13″ toms, and I believe a 13×4″ snare. They’re a little funky-looking , and the hardware is rather flimsy, but can be found used on Craigslist for $50-100, and really sound just fine. A final thought: don’t get too caught up in your instrument, especially in its appearance- what you play is what matters. Remember that you become a player by playing, listening, and watching.